Hosting an Uncorked Art Party at your venue is a great way to help new customers find their way to your establishment on evenings or afternoons you are not usually busy, any time of the year. Parties are typically 2- 2.5 hours in length (3 with set up and clean up) and can be held any week day evening (6:30-8:30pm or 7:00-9:00pm works well) or weekend afternoon (1:30-3:30pm or 2:00-4:00pm works well). 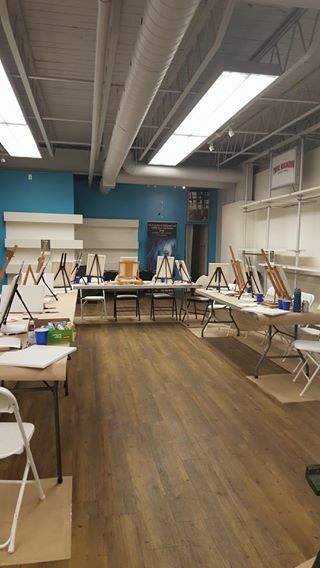 We charge participants $35 per person for all of their supplies and the paint class instruction and all drink and food profits go to the venue in lieu of a venue fee. If you have other items to purchase (such as bottles of wine, gift merchandise, or gift certificates) painters will be made aware and all profits from these sales will of course go to the venue as well. Although participants are fairly focused on their paintings during the event, they are asked to attend 30 minutes before the class starts and encouraged to purchase and drink and a snack. There are also breaks throughout the class (while layers dry) allowing for more food and drink orders. Many painters will sip and snack throughout the class. Email Uncorked Art Parties owner and instructor Amber Wardell at uncorkedartparties@gmail.com with questions or fill out the below form to have Amber contact you.